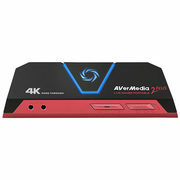 Capture your gameplay with the plug-and-play simplicity of the AVerMedia Live Gamer Portable 2 Plus. Dual 4-pole audio ports let you add your own commentary, and you can even capture your team-mate's contributions. The LGP2 comes bundled with RECentral 3 software -- a customizable hub where you can stream, record, edit, and share your gaming action.